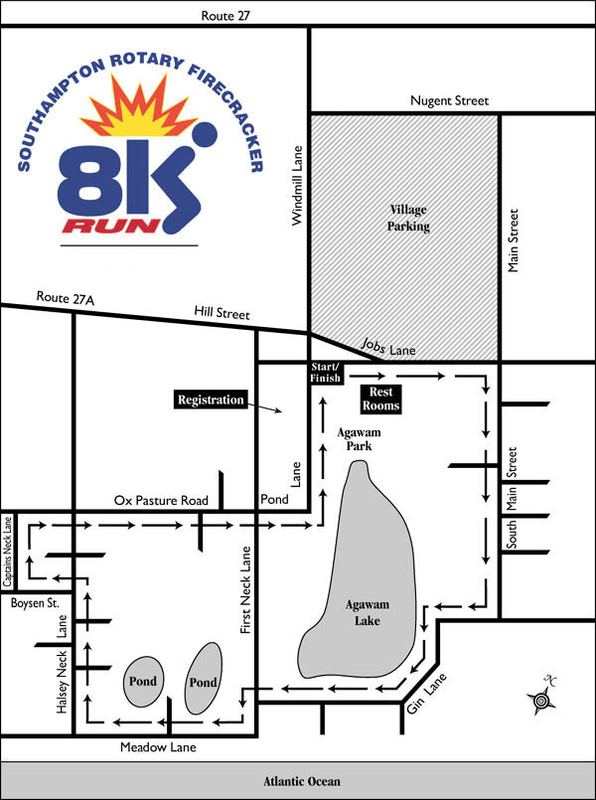 The Southampton Press presents The 26th Annual Southampton Rotary Firecracker 8K Run and 3M Walk Sunday, July 3, 2016 at 8:00 AM To benefit the Southampton Rotary Scholarship Fund. START and FINISH at Southampton's beautiful Agawam Park. The course is flat and fast! I know that running a road race is a potentially hazardous activity, and that I should not enter unless I am medically able and properly trained. I also know that although police protection will be provided, there may be traffic along the course route. I will assume the risk of running in traffic. I also assume any and all other risks associated with running this event including but not limited to falls, contact with other participants, the effects of weather, including high heat and/or humidity, and the condition of the road, all such risks being known and appreciated by me. Knowing these facts, and in consideration of your acceptance of my entry fee, I hereby for myself, my heirs, executors, administrators and anyone else who might claim on my behalf, covenant not to sue, and waive, release, and discharge any organization associated with the race, and the local governments and police, volunteers and sponsors from all claims for personal injuries or property damage, even if such injury or damage is caused by the negligence of any of these parties. I agree that the Firecracker 8K Run officials have the right to remove me from the race and related activities if they are of the opinion that is my best interest that I be removed, or if they are of the opinion that I have violated any USATF or IAAF rules. The undersigned furtheer grants permission for this race and any organization conducting the race, and/or agents used by them, to use any photographs, videotapes, motion pictures, recordings, or any other record of this event for any purpose. I have read the forgoing and certify agreement by my signature below.